In Trincomalee, the east of Sri Lanka, is situated the sea side town of Uppuveli. Her Holiness Sri Swami Sivananda Satchidananda Saraswati Mathaji a disciple of the Himalayan Saint of Rishikesh H.H. Swami Sivananda Maharaj, after receiving her orders and blessings from her preceptor the Himalayan saint proceeded to her home town of Trincomalee and began her spiritual work. She chose Uppuveli where her inherited lands were and set up an ashram in the year 1953 naming it after her revered Guru H.H. Swami Sivananda. This ashram is a home for the destitute the orphaned and the handicapped for whom their was no sanctuary to shelter them. Mathaji began work with a nuclear of her handful of children. Girls and boys and certain willful helpers organized the ashram in a very systematic manner; her experience as a respected senior English teacher affording her strength and knowledge to run the ashram. 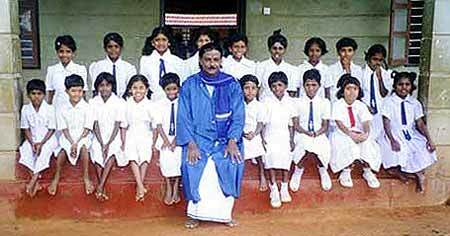 Sivananda Thapovanam is a vortex of spirituality and good training for growing up children. The ashram is functioning as a state approved charity named after Swami Sivananda Satchidananda Saraswati Mathaji's parents as the Nagaratnampillai Thangammal Trust. Today there are total 160 registered children under age 18 who are resident in the home. 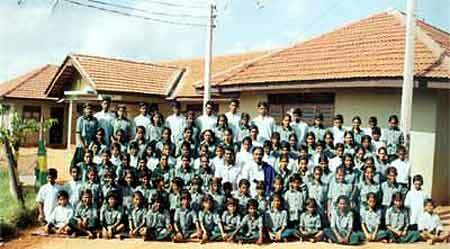 Sivananda Thapovanam is situated upon 20 acres of land. The main building is of 11,000 sq.ft in extent. Girls are being brought up in a building that is 11,000 sq.ft in extent with all facilities. Boys are homed in a similar building that is 24 km away from the girls' home. This building is 7,000 sq. ft. in extent with all facilities. From time to time Thapovanam has undergone vicissitudes of political nature and also that of nature. The natural calamities that affected the ashram was first in 1964 when the eastern province, lying in cyclonic, belt experienced trauma of a severe cyclone ashram was badly affected. The ashram-suffered great loses due to the civil disturbances of 1983, and the inmates of the ashram had to be evaluated due to the immense damage to the building, which was inhabitable. Despite all these problems her devoted disciple Srimathy Selvam Kalyanasuderam (Barrister at Law (who has now passed away) shepherd the ashramites and with untiring work rebuilt on the original site a habitable section in 1996 and the children returned happily to Uppuvel to reside and continue their educational and spiritual activities. 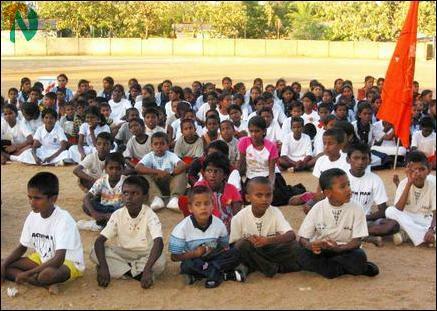 Generations of children have benefited through the monumental work done at the Sivananda Thapovanam. The most recent Tsunami affected the eastern province and Sivananda Thapovanam took a heavy beating. Lying only about 200 meters away from the ocean. The boundary walls of the ashram, the habitation of married ashramites and all the personal belongings were lost to the immense tidal wave. It can be said the ashram buildings and the environs have to be totally restructured for proper ashram living.